Food such potato chips,french fries and so on. Used for food flavoring during food production process with automatic control. Single-drum Flavoring Machine Continuous Single-drum flavoring machine can be used for seasoning and mixing food flavoring. The fried food seasoning machine has one big function, that the sack food more delicious and tasty. The seasoning machine have two type capacity GGF-1 and GGF-2. 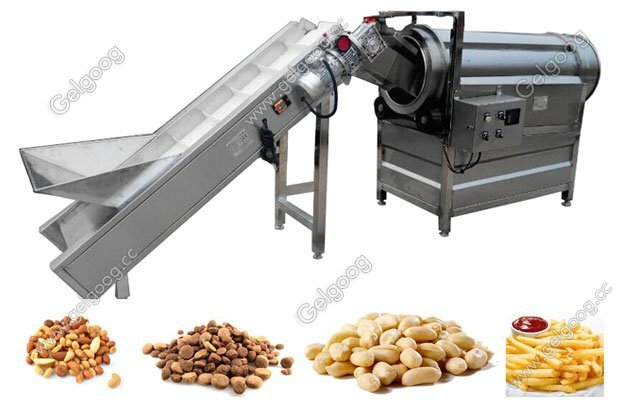 The flavoring machine also can use with snack flavor line,such as potato chips production line. The chips flavoring machine is made of stainless steel. It is very easy to maintain and clean. What is more, the snack food diameter and length can be customer-made according your demands. The powder will be stirredand quantitative accuracy with the machine help. The french fires seasoning machine has high degree of automation features. That is why the flavoring machine are so popularity . What kind of food can be process with the seasoning machine? The snack food falls into the drum, and it moved upward by the stirring blade. It is dropped from above and mixed with the seasoning powder. During the working process, the seasoning is always kept in the dusting box. When the seasoning is insufficient, it should be added in time. The equipment adopts the 220 v power input, the output roller motor as: 380 v, dusting motor is 220 v.
Start the roller machine, and roller will start slowly to normal speed. Start dusting motor, dusting equipment begin to work. Feeding snack into the machine , or putting mix seasoning ingredients from feeding port to conveyor. Check the running parts, start working after ensuring normal operation.